This celebrated work, now in the New York Museum of Modern Art, is part of series painted while was with his young family in the Fontaineblueau in the summer of 1921. It marks a return to high Synthetic Cubism and his enduring Commedia dellArte imaginary, commenced in the early days in Paris. His continuing association with the refined world of ballet, through his wife and through his work designing sets and costumes for Diaghilev, is evident throughout. 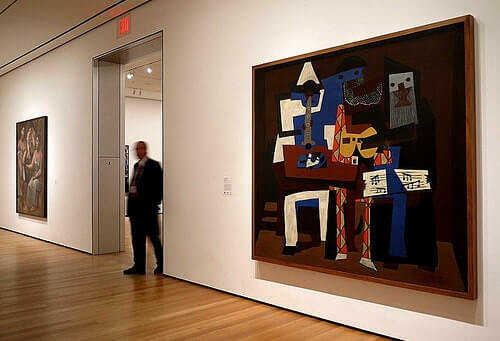 Picasso paints three musicians made of flat, brightly colored, abstract shapes in a shallow, boxlike room. On the left is a clarinet player, in the middle a guitar player, and on the right a singer holding sheets of music. They are dressed as familiar figures: Pierrot, wearing a blue and white suit; Harlequinn, in an orange and yellow diamond-pattered custome; and, at right, a friar in a black robe. In front of Pierrot stands a table with a pipe and other objects, while beneath him is a dog, whose belly, legs, and tail peep out behind the musician's legs. Like the boxy brown stage on which the three musicians perform, everything in this painting is made up of flat shapes. Behind each musician, the light brown floor is in a different place, extending much farther toward the left than the right. Framing the picture, the floor and the flat walls make the room lopsided, but the musicians seem steady. Music Makers in Harmony; It is hard to tell where one musician starts and another stops, because the shapes that create them intersect and overlap, as if they were paper cutouts. Pierrot, the figure in blue and white, holds a clarinet in his hands; one hand is connected to a long, thin, black arm, while the other hand lacks an arm. Three Musicians emphasizes lively colors, angular shapes, and flat patterns. Picasso said he was delighted when "Gertrude Stein joyfully announced... that she had at last understood what... the three musicians was meant to be. It was a still life!" To many art historian, Three Musicians may be seen as Picasso's belatd reply to The Piano Lesson, the huge music-making scene Henri Matisse painted in the summer of 1916. Picasso's desire to win back the initiative from Matisse in the exploitation of the decorative potential of the synthetic Cubist style emerges in this painting in the boldest possible manner. 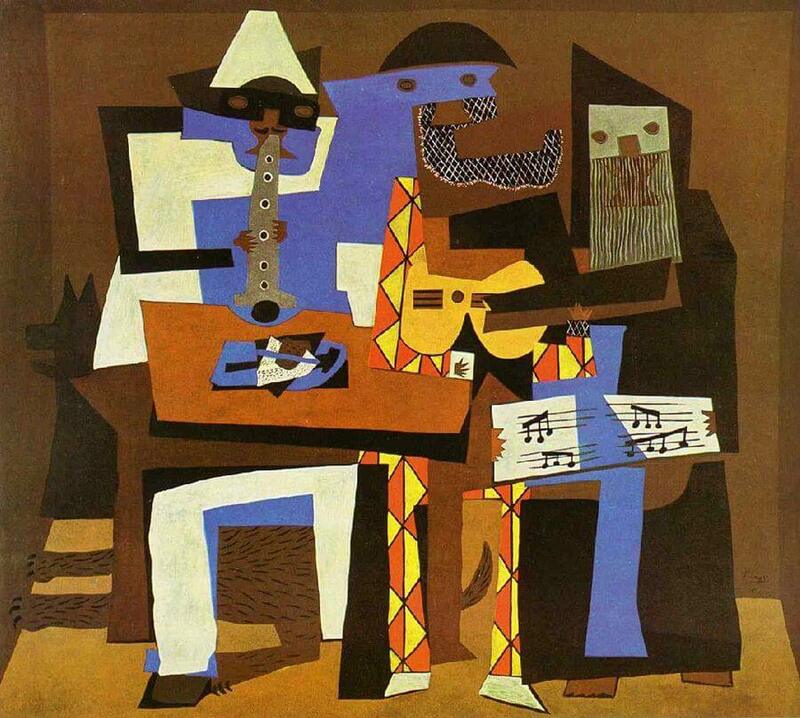 Three Musicians is a perfect example of Picasso's Cubist style. In Cubism, the subject of the artwork is transformed into a sequence of planes, lines, and arcs. Cubism has been described as an intellectual style because the artists analyzed the shapes of their subjects and reinvented them on the canvas. The viewer must reconstruct the subject and space of the work by comparing the different shapes and forms to determine what each one represents. Through this process, the viewer participates with the artist in making the artwork make sense.